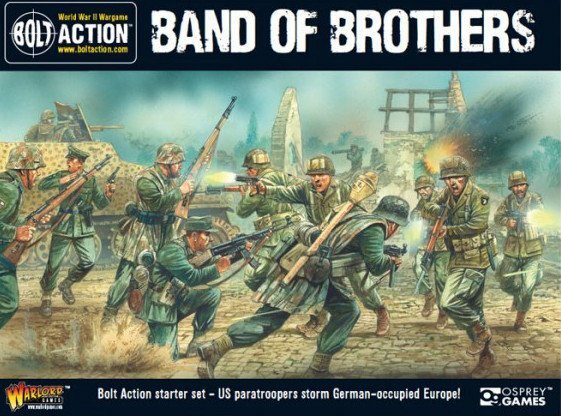 This supplement is designed for use with the Skirmish Sangin rulebook. 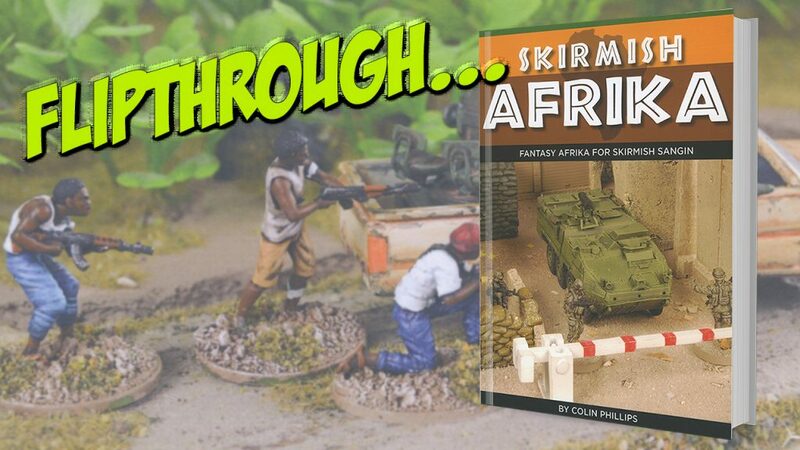 Skirmish Afrika provides a ‘fantasy’ version of a troubled continent in a modern world that is similar but subtly different to our own. The book begins with a map of ‘Afrika’, spelt with a ‘K’, intended to show that this is a different continent to that which we know. 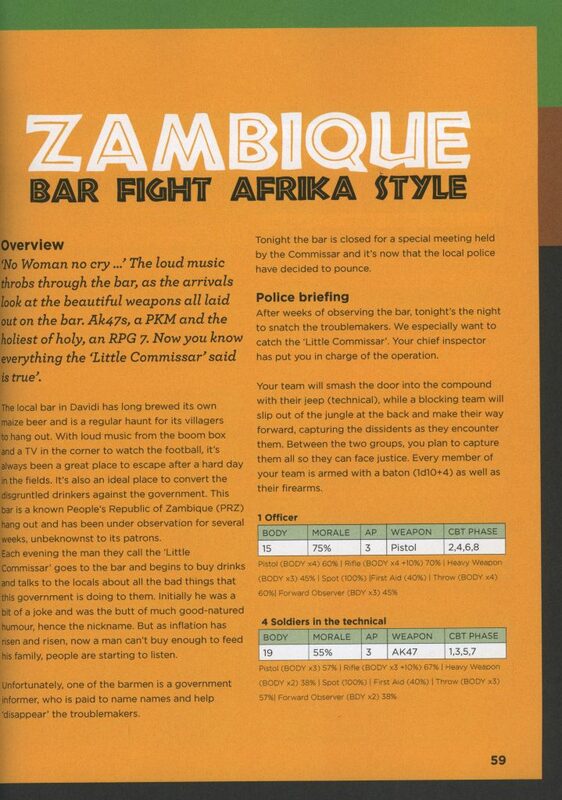 The book then outlines the main nations on this continent, complete with a potted history, details on the military forces in the country and some game statistics. 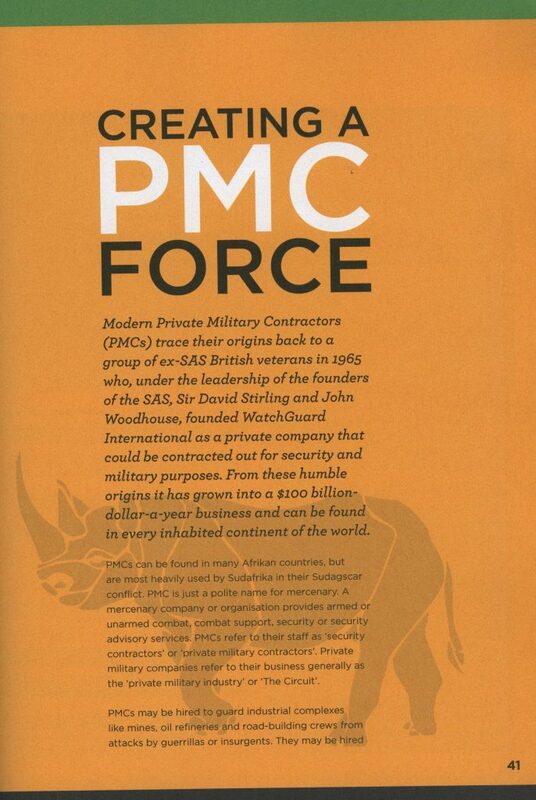 Once the ‘sitrep’ has been established, details are provided on how to create a force of Private Military Contractors – the mercenaries of the modern world, then moves on to creating guerilla forces, showing stats and information for a number of sample units and additional rules that can apply to guerillas. The rules use a points based system. There are a number of sample scenarios outlined in the book, complete with force descriptions, maps, set up information and more. 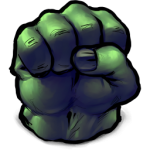 These act as a series of introductory games to help players adjust to the new background and stats. 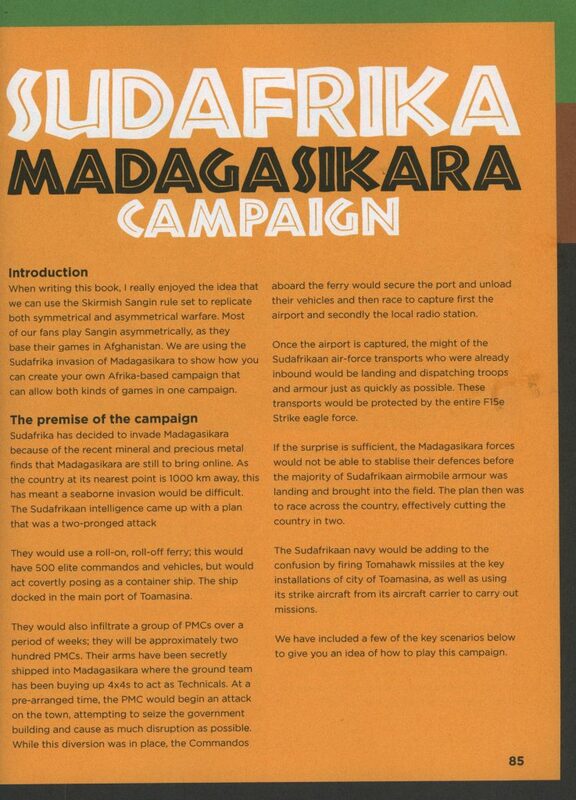 Once you’re familiar with the rules and style of play, there is a campaign system based upon two of the nations outlined in the book, which includes sample mission scenarios that suggest what can be done to run your own typical campaign, or used straight out of the book. 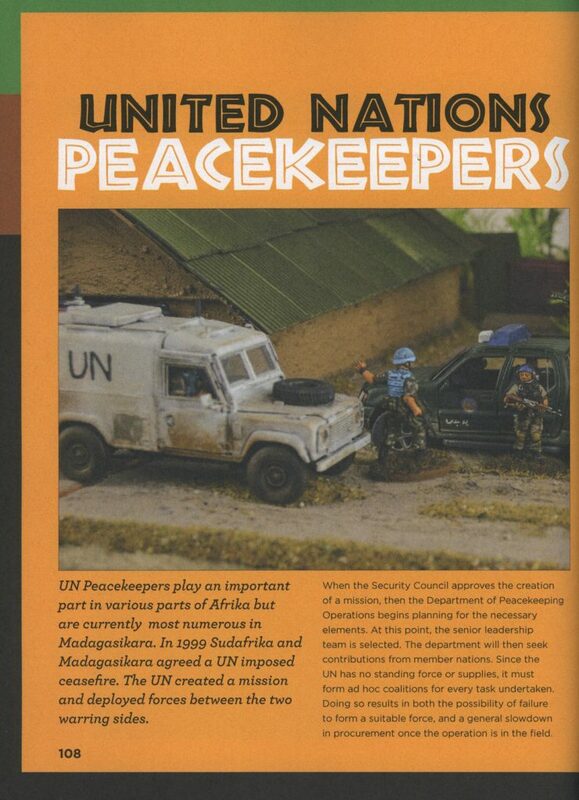 The book also has information on sample UN Peacekeeper forces, uniform images for the main nations and a guide to building your own compound to use as scenery. Although much of the game information is only relevant to the Skirmish Sangin rules system, there are a number of ideas here that could be ported over into other sets. The maps and information for the scenarios in particular, which are well laid out and could easily be adapted. In addition, the whole concept of creating an alternative ‘modern’ setting does attempt to tackle one the moral dilemma encountered by ultramodern period gamers. If you’re looking for a new setting for your Skirmish Sangin games or just need a ‘quick reference’ for an ultramodern setting to use miniatures and models you already have, this could be a handy reference that will save you a lot of work.